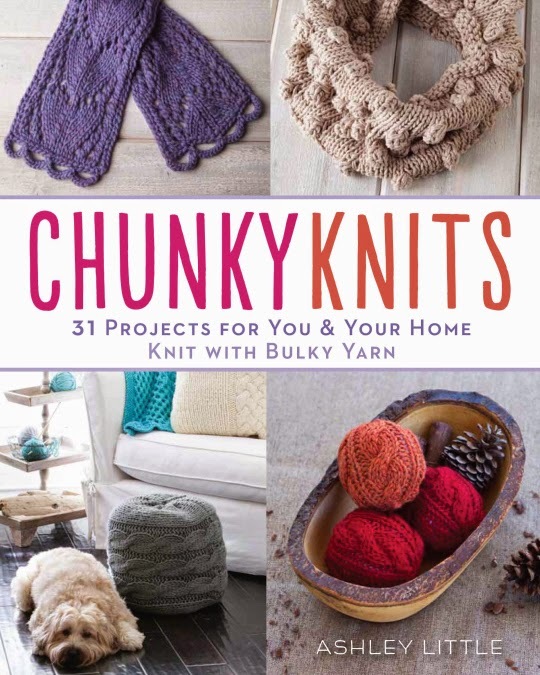 You know much I love the Wacky Baby Knits book. It's Halloween, and I broke the book out again to make another hat. This is possibly the last time I will torture my niece with a hat this calendar year. (She already has a headpiece for Christmas. I'll share that one later!) 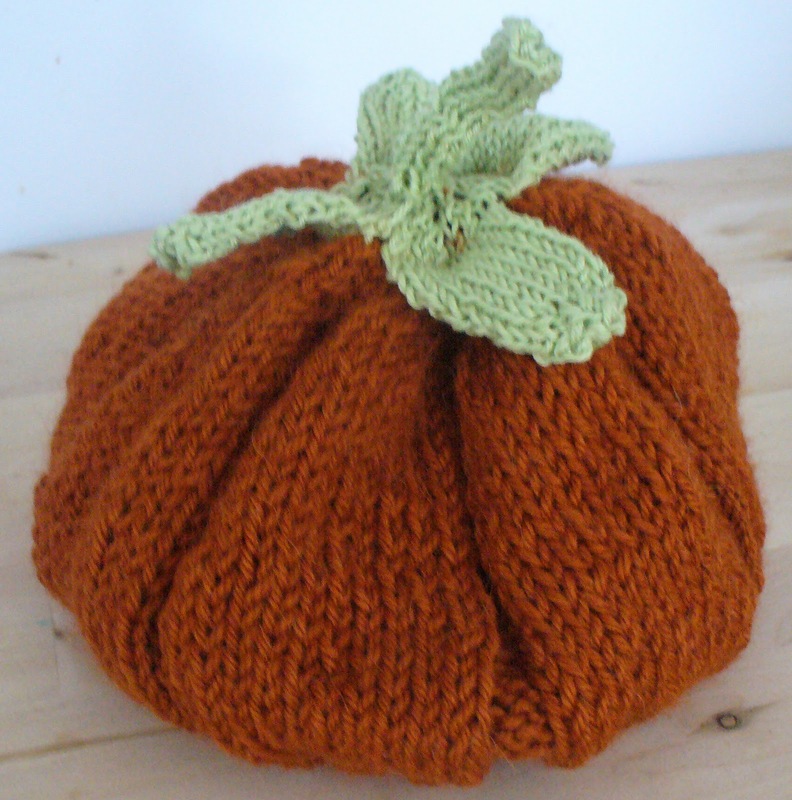 I love the way the purls in the pattern make the pumpkin look more realistic. 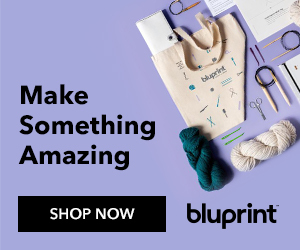 I was also thinking that if you skip the ribbing on the band of the hat, you could stuff it, sew it up, and make a cute little fall decoration from the pattern! 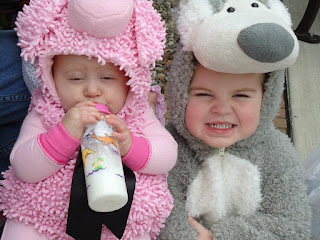 My niece and nephew went with a storybook theme this year dressed as a little pig and a wolf. Hopefully the pumpkin hat will stretch to the Thanksgiving holiday so she can wear it more than once! On what was probably the hottest day of the summer, I rode my bike to Third Ward in Brooklyn and took a fascinator workshop. The fascinator was made by lining a teardrop hat frame with three feather pads. I made the blue flowers from one large artificial flower that I ripped apart, and added three rooster feathers to give it some height. I also sewed some tulle just under one of the flowers. I felt like the fascinator was a little dreary in color, so I bought some purple sew-on stones from M&J Trim, which I then hot-glued to the flower. Shortcut! Sewing things to the hat frame was a pain, especially since I was sweating so much and the needle kept slipping. 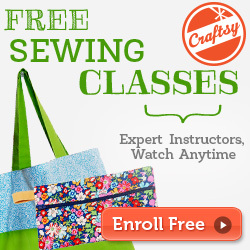 If you're sewing one of these, use a really sturdy needle. What I listened to while I made this project: my sweat drip onto the floor... and maybe even onto the fascinator. Ewww. So whadya think? Where should I sport this crazy thing? Since I moved to New York, financial and spacial restraints have pretty much put a stop to shopping for new clothing. My solution? Clothing swaps. When I hosted a Singer Sewing Party back in May, a lot of the guests were using sewing machines to alter their clothing. My friend and I decided that a combination clothing swap/sewing party was inevitable. Everyone at the party went home with a hefty bag of "new" stuff. 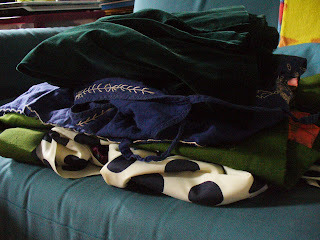 My personal favorite find was a vintage emerald green velvet blazer! Big pimpin'. We ended the party with -- to my downstairs neighbor's disappointment -- a little Wii Dance-off. 1. Set up a sewing machine for guests. There will be a lot of different sizes, so you want people to be able to alter clothes on the spot. 2. Organize! Make piles around the living room for shirts, pants, accessories, and dresses to keep everything separated. 3. Designate a changing area. I use the bedroom, but offer the bathroom to the more modest guests. 4. Mirrors, mirrors, mirrors! Make sure you have at least one full-length mirror in the changing area. 5. Pass around books for inspiration. I used Little Green Dresses and Megan Nicollay's Generation T: 108 Ways to Transform a T-Shirt reconstruction book. 6. Provide munchies. Munchies are not only yummy, but they will keep the guests rotating from the trading room to the kitchen so no one gets swap burn-out! I like to keep it simple: cheese, crackers, hummus, chips, fruit. Ever hosted a clothing swap? 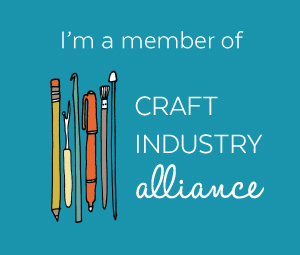 Have tips to share? You know how much I love the perk of sewing classes at work with the ladies from Singer. 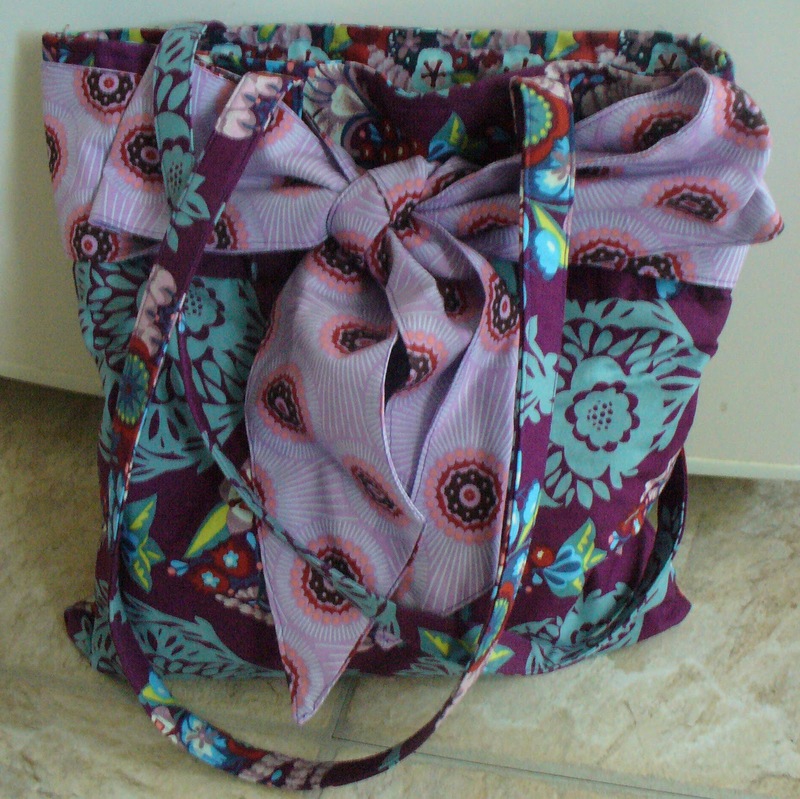 Last week, the project was this lined tote bag with a bow. The fabric just happens to be one of my favorite colors (purple!). It took me about 2.5 hours to complete this (keeping in mind that the pattern pieces are cut and prepped for us when we arrive). This tote is one of my favorite projects we've made in the class. 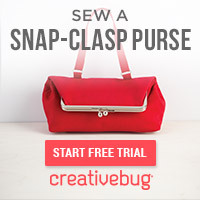 The straps do double-duty as both straps and loops that secure the bow onto the tote. Plus, it's lined for people like me who carry books, lunches, yarn, and other super important items. Heehee. What I liked about this project: Considering how great the final product looks, it didn't really take that much time to sew. I also like the contrast of the bow fabric on the tote fabric. Another great thing about this project is that you can switch out the bow for a different look. Or you can use a wide ribbon instead of the fabric bow. What I didn't like about this project: The bow was a big pain. Thankfully, the Singer gals had already cut and pinned it for us, but sewing it and turning it inside out was tedious. What I listed to while I made this: Coworker chatter. It's around this time of year that I feel super droopy and upset that summer has left me. It's a rough transition. I went from using daylight hours to bike and hang out with friends to dragging myself home after work to a dark hallway full of dead plants and spider webs. My hallway needed a real pick-me-up, and I've had my eye on the Felt Flower Wreath from Little Things Bring Smiles for a while. I followed Katie's how-to pretty closely. Trace circles onto the felt using a CD and a disappearing ink pen. Cut out the circle. Begin to cut your circle into a spiral. Roll it toward the center to form the flower. I used the excess felt at the end to seal the flower and make it stick to the wreath more securely. Hot glue your flowers to the wreath! I would suggest arranging them before gluing to make sure you're happy with the color combinations and placement. It didn't take a lot of time, plus the supplies didn't cost more than $10! The pieces of the grapevine wreath kept falling off. I'm worried that the flowers are not going to stick! What kind of little touches do you put around the house when it gets cold?